A few days ago I was attending a first aid class (for my new driver’s license), when the teacher asked us to Google for common signs of a stroke and what to do when someone is having one. So I went on my phone and did a logical search for: what to do during a stroke. 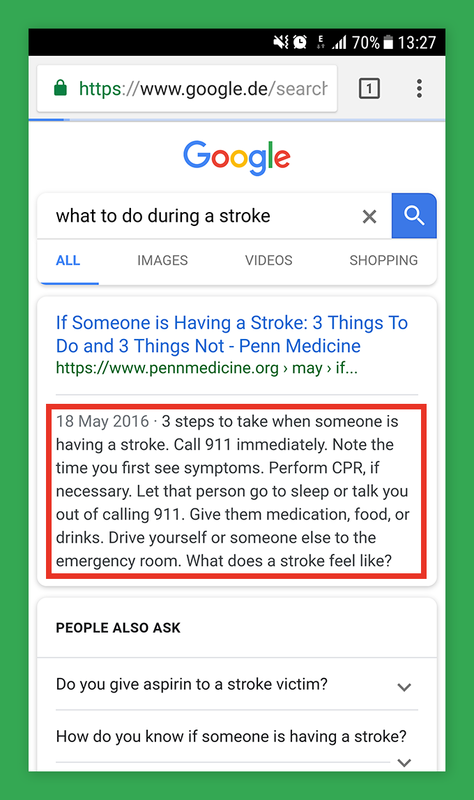 The very first result, both on mobile and desktop links to this page: If Someone is Having a Stroke: 3 Things To Do and 3 Things Not To Do. Some of you probably see what the problem is. A half of that automatically generated snippet is for what you SHOULD NOT do when someone has a stroke. You should NOT: Drive yourself or someone else to the emergency room. Considering that we live in the age of #fakenews and alternative facts, having incorrect medical advice at the top of our search results is very worrisome. Would a simple meta description solve this issue?